Backing a ResourceBundle with Properties Files Tips. Java is very dynamic programing language. With thousands of APIs available for us to use, we do have a freedom of choice. Some time back I’ve written an article on How to Read config.properties Values in Java? java.util.Properties is very strong API to retrieve, update config properties values at runtime which I used in previously mentioned tutorial . In this tutorial I’ll go over ResourceBundle.getBundle API for the same. Properties file is used to store project specific settings, i.e. It’s very important to use properties file and you should use it most of the time if you need use some properties at multiple location which has dynamic value. Just update in config.properties file and it you will get updated value at all the location. 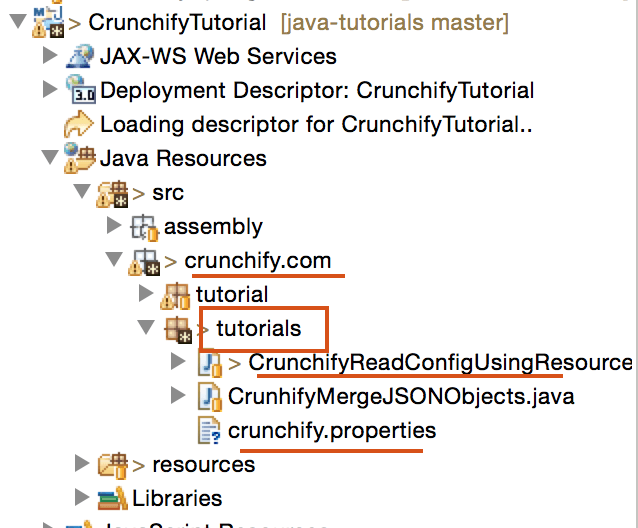 In this tutorial we will name our config file to crunchify.properties. Above method gets a resource bundle using the specified base name, the default locale, and the caller's class loader. Calling this method is equivalent to calling getBundle(baseName, Locale.getDefault(), this.getClass().getClassLoader()). Run the program and checkout result. How to load and use a resource bundle from a file resource in Java? What is resourcebundle in java? How to load resource bundle from classpath and in Eclipse?